Globally popular sports monthly magazine, Sports Illustrated, staged its sixth Annual Sports Person of the Year (SOTY) Awards night recently. 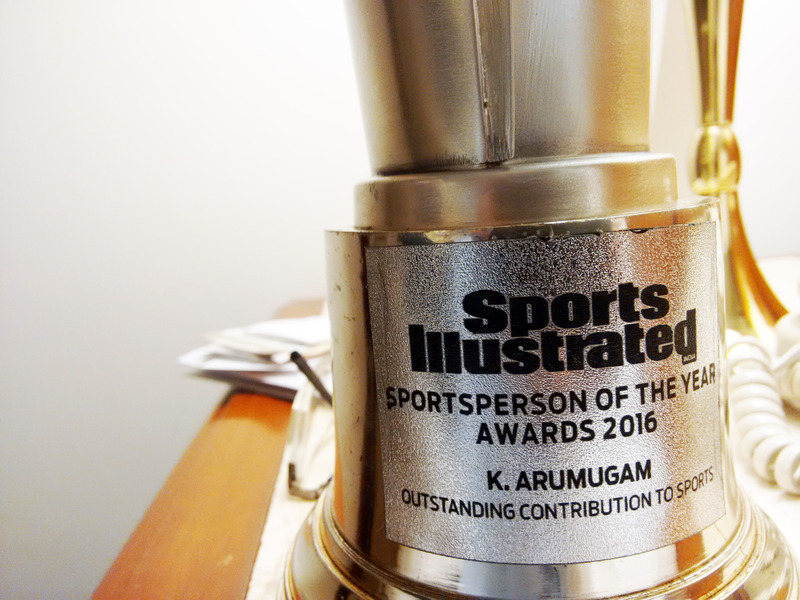 While Olympic Gold medallist PV Sindhu was declared Sports Person of the Year and her coach Khel Ratna Gopi Chand as Coach of the Year, our NGO got a big boost when its founder K. Arumugam was chosen for one of the awards under the 'Contribution to Sports' category. The award was handed over to him personally on the stage by living legend of Indian football, Baichung Bhutia. The Maruti Suzuki Sports Illustrated Sportsperson of the Year Charity Gala was held on Thursday, the sixth July 2017 at the ITC Maurya Collection Hotel facility in Mumbai. OTHL founder was provided air travel from Delhi, boarding and hospitality in Bombay by the organizers. <i>In 2008, Indian hockey touched its lowest point after the national team failed to qualify for the Beijing Olympics. Never before in the history of the Olympics the national game, which fetched the country eight gold medals in the quadrennial Games, faced ignominy of this magnitude. Predictably, it caused considerable amount of despair among hockey fans and former players. Equally predictably, all was forgotten the moment the headlines moved on to other pressing matters. But one man took India’s failure to qualify for the Olympics as a personal loss. 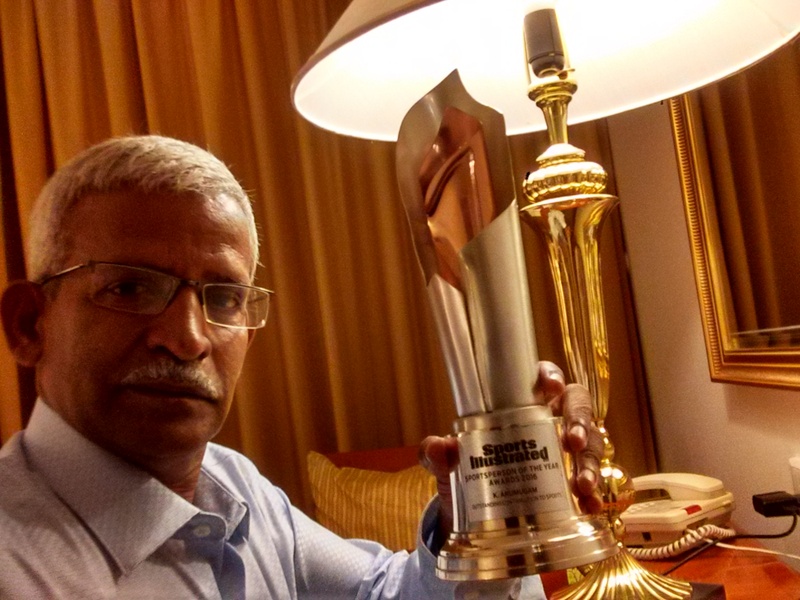 K. Arumugam, a hydrologist by profession, and an ardent hockey lover, who had already devoted a considerable amount his lifespan and earnings chronicling the fortunes of Indian hockey for close to two decades as a hockey writer and stats keeper, decided to do his bit to arrest the freefall of Indian hockey. He believed that one of the root causes for the declining fortunes of the game was not enough children were taking to hockey in their formative years. Thus, the Hockey Citizen Group was born. Arumugam formed a collective of like-minded hockey lovers with the purpose of revitalising the game at the grassroots level. The brains behind this initiative felt that instead of the elite public schools, the game would be much better received and appreciated in government and trust-funded schools. And as the first project of the NGO it launched the One Thousand Hockey Legs (OTHL) programme with the ultimate target of introducing 500 children to the game across the country through schools. 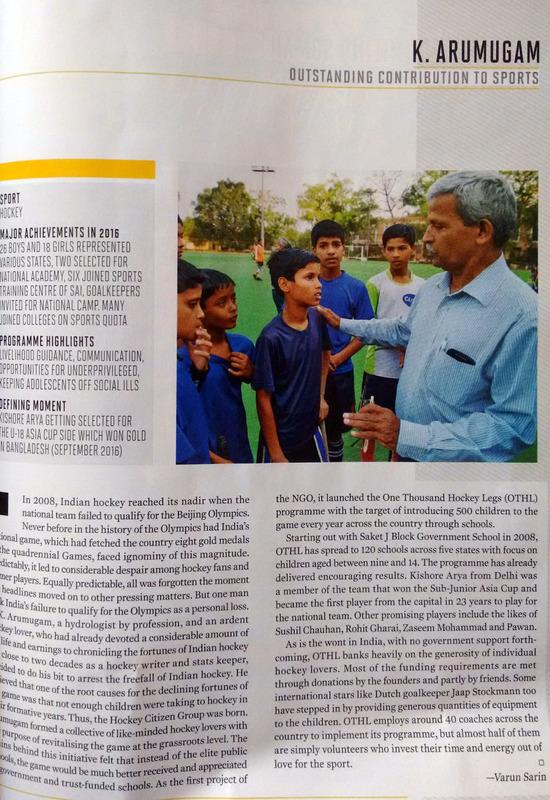 Starting out with Saket J Block Government School in 2008, OTHL has spread to 120 schools in five states. The programme has already delivered some encouraging result. Kishore Arya from Delhi was a member of the team that won the Sub-Junior Asia Cup to become the first player from the capital in 23 years to play for the national team. The other promising players that OTHL has produced include the likes of Sushil Chauhan, Rohit Gharai, Zaseem Mohammad and Pawan. As is the wont in India, with no government support forthcoming, OTHL banks heavily on generosity of individual hockey lovers. Most of the funding requirements is met through donations by the founders and friends. Some international stars like Dutch goalkeeper Jaap Stockmann too have also stepped in by providing generous quantity equipment to the children. OTHL employs around 40 coaches across the country to implement its programme, but almost half of them are simply volunteers who invest their time and energy for the love of the sport. Programe Highlights: Livelihood guidance, communication opportunities for underprivileged, keeping adolescents off scoial ills. Defining Moment: Kishore Arya getting selected for the U-18 Asia Cup side which won Gold in Bangladesh (September 2016). Sports Illustrated award is the third popular recognition for the OTHL in three years. 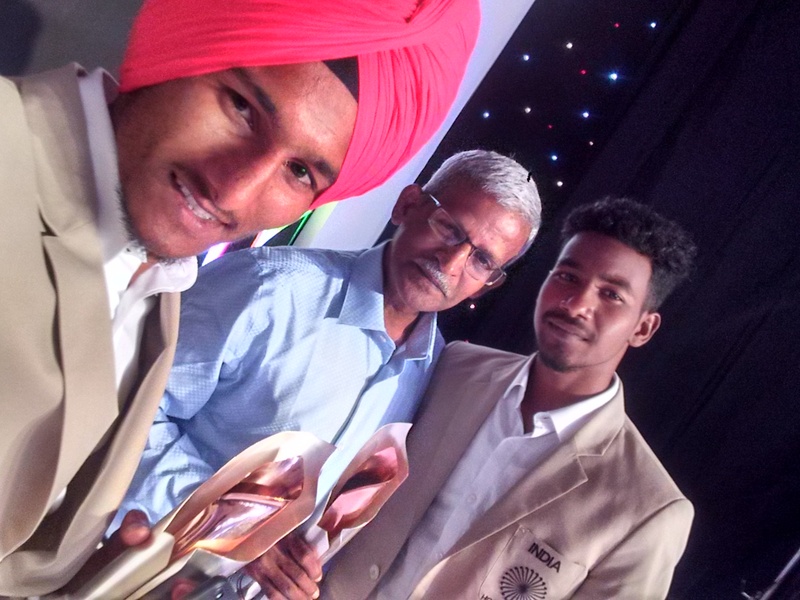 It started from Hockey India President's Outstanding Achievement Award (2015) before the President of India's National Sports Promotion at Grassroot Award (2016) was accorded amidst the galaxy of Rio Olympic achievers.